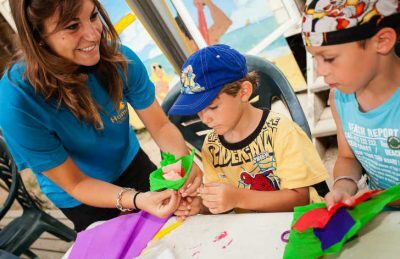 Les Sablines is fantastic 4 star quality campsite that makes an ideal spot for a family holiday. The campsite is both well maintained and well landscaped with a variety of beautiful plants, flowers and trees to ensure that you feel like you’re in paradise. Protected by sand dunes, Les Sablines benefits from direct access to a beautiful beach via a 900m walk through the dunes. Once on the beach you’ll realise why Les Sablines is such a popular campsite. Soft golden sand stretches out as far as the eye can see in either direction. Perfect for families of all ages, the beach offers a whole variety of things to do including swimming, sunbathing, buildings sandcastles, playing games and you can also have a go on pedalos, sailing and a variety of other water sports nearby. A little further along the coast and you’ll come to Valras-Plage. A modern seaside resort that still retains its traditional charm, Valras-Plage is a brilliant place to visit for the day. One of the best things about Les Sablines campsite is its fantastic swimming pool complex. A haven for families of all ages, you’ll find a brilliant lagoon styled family swimming pool, jacuzzi pool, variety of water slides and plenty of outside seating area where you can sit back and relax at the end of a long day. Les Sablines is fantastic family friendly campsite and as a result the on site activities and facilities and superb. On site activities at Les Sablines include football, basketball, volleyball, running track, boules, playground and cycle hire. Facilities available at Les Sablines include WIFI, restaurant, takeaway, cafe bar, bakery service, animation team, games room, washers and dryers. Accommodation at Les Sablines campsite includes a range of 2 bedroom mobile homes that are available from Eurocamp.